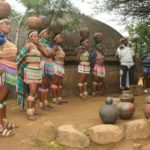 One of the first “soaps” to be produced when South Africans were allowed television in the 1970s was a drama series telling the story of King Shaka, the illegitimate son of King Senzagakona. Shaka almost single-handedly built the Zulus from a comparatively insignificant tribe into a warrior nation justly feared by all the other Black nations with whom they came into contact. The part of Shaka was played by Henry Cele, a giant of a man who entered wholeheartedly into the role. In his younger days he had played professional soccer as a goalkeeper, and he always wore a black outfit, thereby acquiring the nickname “Black Cat” Cele. 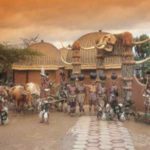 The television company built a permanent set for the filming, and once filming was complete, the entire site – a few kilometers from Eshowe in the Nkwaleni Valley – was turned into a tourist hotel designed to provide overseas tourists with an African experience. Shows are held daily, with staff performing dances and singing. 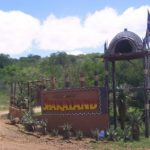 Accommodation is available on site.